- Heckler & Koch Mark 23. - The Heckler & Koch MK23, Mk 23 Mod 0, Mark 23, or MARK 23, is a handgun consisting of a match grade semi-automatic pistol, a laser aiming module (LAM), and suppressor. The MK23 Mod 0 was built as an "offensive" handgun for U.S. special operations forces under USSOCOM, as per request made in 1989. Military versions of the firearm have the writing "MK23 USSOCOM" engraved on the slide. The MK23 is considered a match grade pistol, and is capable of making a 2-inch (51 mm) group at 50 yards (46 m), roughly 4 MOA. 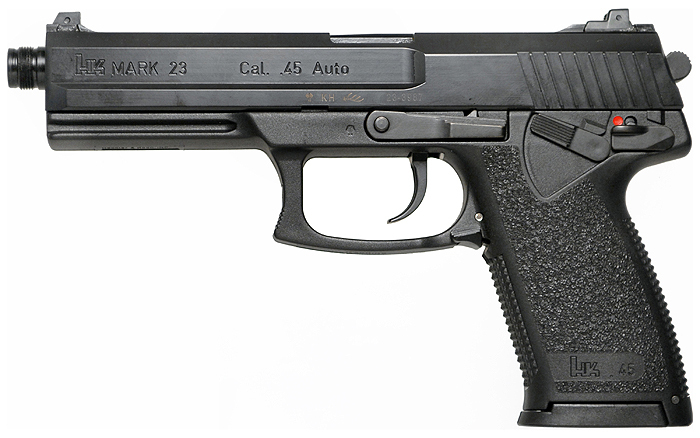 Production began in 1991, and it was the basis for the HK USP, which began production in 1993. The MK23 has exceptional durability in harsh environments, being waterproof and corrosion-resistant. It uses a polygonal barrel design, which is reported to improve accuracy and durability. It also features an ambidextrous safety and magazine release on both sides of the frame. The magazine release is at the rear edge of the trigger guard, which is wide enough to allow the use of gloves. A decocking lever is on the left side, which will silently lower the cocked hammer. The MK23 is part of a larger weapon system that includes an attachable laser aiming module, a suppressor, and some other features such as a special high-pressure match cartridge (.45 +P ammunition). The firearm was tested and found to be capable of firing tens of thousands of rounds without a barrel change. It remains reliable in harsh conditions, making it suitable for use by special forces. The .45 ACP round has considerable stopping power, and yet is subsonic making it suitable for use with a suppressor. Additionally, its shared design characteristics with the Colt M1911 pistol have made it easy for people who have experience with a 1911 to field strip and properly clean the MK23. The pistol uses .45 +P ammunition, and has laser sighting, along with a detachable flashlight. The suppressor can be detached and re-attached on the field as well but not an advised thing. Tends to be worn around the belt on the holster to the left of the waist. - The KM2000 (KM designates Kampfmesser, literally "combat knife") is the standard knife of the German Bundeswehr, mostly used by the German Army. The knife is manufactured in Germany by the Eickhorn-Solingen company (aka "Original Eickhorn"). The knife is produced according to NATO regulations by the German company Eickhorn-Solingen Ltd. The assembly consists of three components: the laser cut 172 mm Black Kalgard coated, forged 440A stainless steel Westernized tanto blade, the ergonomic ambidextrous polyamide handle and screw. The entire knife weighs approximately 320 grams. The sheath for the KM2000 is turnable, and includes an adapter to allow it to be mounted onto the MOLLE/PALS load bearing system(s). It is worn on a sheathe to her right waist. - The M67 grenade is a fragmentation hand grenade used by the United States Military and Canadian Forces, where it is referenced as the C13. The M67 is a replacement for the M61 grenade used during Vietnam and the older Mk 2 "pineapple" grenade used since World War II. 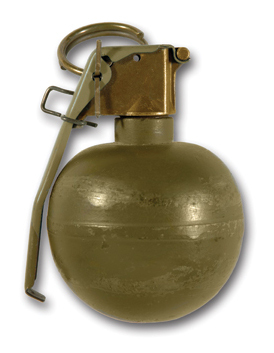 The M67 Grenade has a spherical steel body that contains 6.5 ounces of Composition B explosive. The M213 fuse is specifically designed for use with the M67 fragmentation grenade. The M67 grenade weighs 14 ounces in total and has a safety clip to prevent the grenade from detonating accidentally. The M67 can be thrown 30 to 35 meters by the average male soldier. It has a 4.0–5.5 second fuse that ignites explosives packed inside a round body. Steel fragments (not to be confused with shrapnel) are provided by the grenade body and produce an injury radius of 15 meters (~45 ft), with a fatality radius of 5 meters (~15 ft), though some fragments can disperse as far out as 250 meters. - The M84 also known as a flashbang or stun grenade is the currently issued stun grenade of the United States Army. Upon detonation, it emits an intensely loud "bang" and blinding flash of more than one million candela and 170–180 decibels within five feet of initiation, sufficient to cause immediate (but temporary) flash blindness, deafness, tinnitus, and inner ear disturbance. Exposed personnel experience disorientation, confusion and loss of coordination and balance. The M84 is classified as a Less-lethal weapon. The M84 features a magnesium-based pyrotechnic charge inside a thin aluminum case, contained within a perforated cast steel body. Unlike traditional HE-based ordinance, the pyrotechnic charge produces a subsonic deflagration, not a supersonic detonation, minimizing the blast effects. On initiation, the inner aluminium case is designed to be consumed by the pyrotechnic compound, with only the auditory and visual elements of the deflagration being permitted to escape via the perforations in the cast outer body. This design minimizes the risk of collateral damage due to flame, blast and unconsumed fragments of the inner case. It is intended to be thrown into enclosed spaces to distract and temporarily incapacitate enemy personnel for easier capture, or when risk of collateral damage during urban warfare or hostage rescue operations contravenes the employment of traditionally lethal and destructive fragmenting high explosive ordnance. US Army doctrine calls for the M84 to be deployed "during building and room clearing operations, when the presence of noncombatants is likely or expected and the assault element is attempting to achieve surprise." However, while the M84 is generally incapable of igniting paper or cloth, it can still ignite extremely flammable liquids or vapors (such as concentrated gasoline or ether fumes) in the immediate area of the grenade. Can speak English with an understanding of words used by military jargon and usage of them as well, German, Russian, Chinese and Japanese as per the Executioner programming.